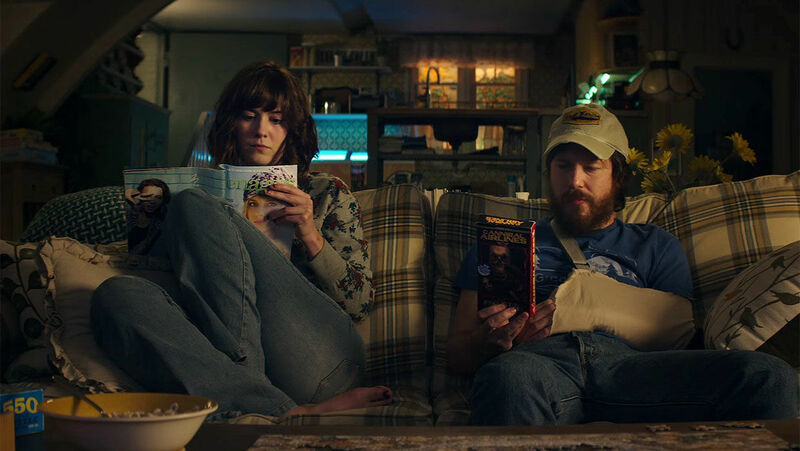 by Joshua Wieder 10 Cloverfield Lane is a spiritual successor to the 2008 monster/kaiju film, Cloverfield, and it happens to be Director Dan Trachtenberg’s feature film debut. It should be pointed out, first and foremost, that 10 Cloverfield Lane shares essentially nothing in common with its namesake. The plot is entirely distinct, as are the characters, and none of the dialogue references the events of Cloverfield. Do not go see this film expecting a monster movie or a sequel to Cloverfield; it is neither. Instead, Trachtenberg brings us a mysterious and tense thriller about a kidnapped woman in a bizarre situation. Michelle (Mary Elizabeth Winstead), our main character, is a young woman living in an unknown midwestern urban center. After having an ambiguous disagreement with her significant other, she flees to the countryside alone. After surviving a cataclysmic car accident, she awakens to find herself imprisoned in an apocalypse-ready survival bunker with Howard (John Goodman), an eccentric man with a slew of unsettling mannerisms, and his friendly acquaintance, Emmet (John Gallagher Jr.). Howard tells her that he’s saved her from a catastrophic incident of some kind and that everyone on the outside is surely dead. The events that follow are beautifully constructed, full of tension and revelation, intent on making the viewer as uncomfortable and claustrophobic as possible. To that effect, the movie succeeds with flying colors. The tone is expertly crafted (aided by the deliberately vague circumstances and well-paced buildup of tension), but the film also excels in terms of character development. Michelle’s and Emmett’s actions are easily understood and their motivations are made clear. Contrary to horror film tropes, these characters are not stupid. Michelle is especially clever, thinking quickly on her feet to try to get herself out of particularly sticky situations. As for Howard, mystery encapsulates his past and present, and the film leaves us to wonder if his actions are justified or insane. Our perception of Howard fluctuates alongside Michelle’s; at times he seems fatherly and sensitive, while at other times he seems like a terrifying monster. The strongest element in the film is the acting, without a doubt. John Goodman demonstrates once again why he is one of our greatest character actors. It’s difficult to imagine any other actor in his stead; he is delicate, nuanced, visceral and eloquently violent. Mary Elizabeth Winstead is poised and cautious. Her actions are somewhat subdued, and this is owed to the nature of her character as an audience surrogate, but even in this relatively restrained role, Winstead shines. Rounding out the cast, John Gallagher Jr. is convincingly inviting, friendly, and warm. Michelle’s conversations with his character bring a much needed relief of tension. 10 Cloverfield Lane falters when a few formal elements are examined more closely. First and foremost, the direction is mediocre at best. The visuals are flat and predictable, and the sets and costumes, rife with potential, are uninteresting because they go unexplored and unappreciated by the direction and cinematography. This isn’t to say that the film as an experience is boring, but Trachtenberg consistently fails to elevate the formal elements into something more meaningful. Dialogue is shot in flat, standard shot-reverse-shot and opportunities to use visuals to strengthen moments of climax are often wasted. Meanwhile, the film’s soundtrack is one of the worst I’ve heard in years. It’s difficult to describe exactly why, but I was praying for silence during the tensest moments, which were often ruined by the strangely adventurous tone of the original score. The music sounds like it belongs in an action film rather than a horror-drama. That being said, the original soundtrack is punctuated by the occasional 50s/60s pop song, played from Howard’s colorful jukebox. The moments supported by these songs are among the strongest, as the music’s tone contrasts beautifully with the film’s. By the end, the narrative, alongside captivating character development, creates a rich mystique that begs to be resolved by an interesting and creative revelation. While there is indeed a revelation included, it feels weak. I’d go as far as to say that the ending feels more like that of a pilot for a cheap science fiction TV show. The ending simply doesn’t fit the tone of the rest of the film, and ultimately fails to realize the potential it sets up. I was disappointed by 10 Cloverfield Lane, but the film isn’t terrible. Don’t go in looking for a highly expressive work of art, and don’t expect a Cloverfield sequel; expect a well-acted, character-driven film with a whole lot of atmosphere, and expect to be stressed for the entire duration.